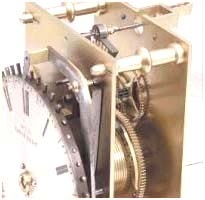 This clock shows the general characteristics of the English "pin clock" that was introduced about 1800 and was still made, at least occasionally, into the second half of the century. 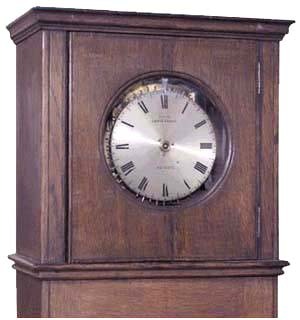 The clocks were made either in the tall case style shown here or in a bracket or shelf-style. Development of the pin clocks has been traced by Paul Harrison in "The Watchman's Tell-Tale Clock, 1800 - 1920." His emphasis is on the social conditions leading to the first use. He explores interesting leads as to the identity of the inventor, but the record does not allow a definite conclusion. 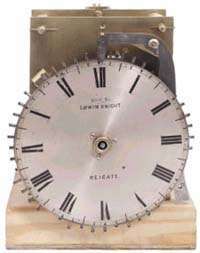 Although Knight worked as late as 1850, this clock is very much like ones produced years earlier and it exhibits the most fundamental weakness of the early pin clocks, namely the ability of a watchman to hold the lever depressed to intercept one of the pins and thus stop the clock. Whitehurst & Son of Derby and Robert Roskell of Liverpool, to name two makers, had incorporated defenses against this decades before Knight's time. The general remedy was to mount the lever in a flexible arrangement that allowed it to be pushed out of the way by an intercepted pin. The best embodiment of this came about once the early makers moved the pins from the periphery positions shown here in the Knight clock to positions in which they stood perpendicular to the face. Edwin Knight Pin Clock, showing some pins depressed and some not.